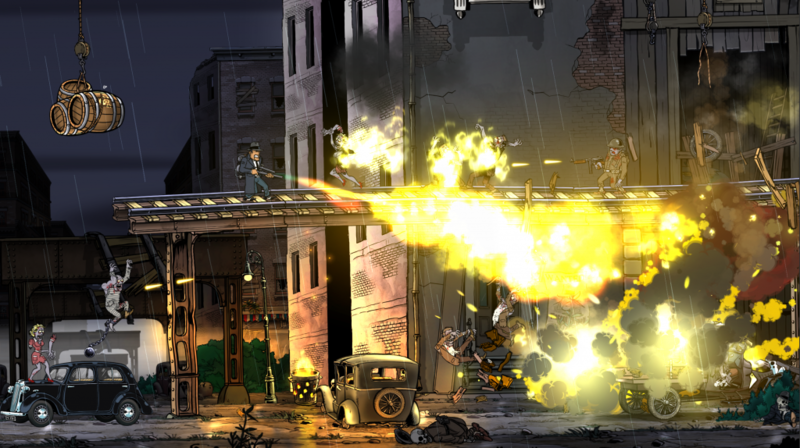 Following the success of the first game, proud FLEGA member Crazy Monkey Studios have recently announced a sequel to their frantic 2D platform shooter Guns, Gore & Cannoli. Expect more guns, more gore, and, of course, more Vinnie Cannoli. Guns, Gore & Cannoli 2 takes place some 15 years after the events of the first game. World War II is in full swing and everyone should’ve forgotten about the Thugtown Massacre already. But when some loose ends of that adventure start to crawl out, Vinnie has no choice but to tackle the problem head on. And he does it the only way he knows: with a Tommy Gun in one hand and a sawed-off shotgun in the other. That’s right, you’ll be able to wield dual guns to mow down enemies even faster. Other new features include double jumping, dodge rolls, a refined movement system with 360° aiming and online co-op. 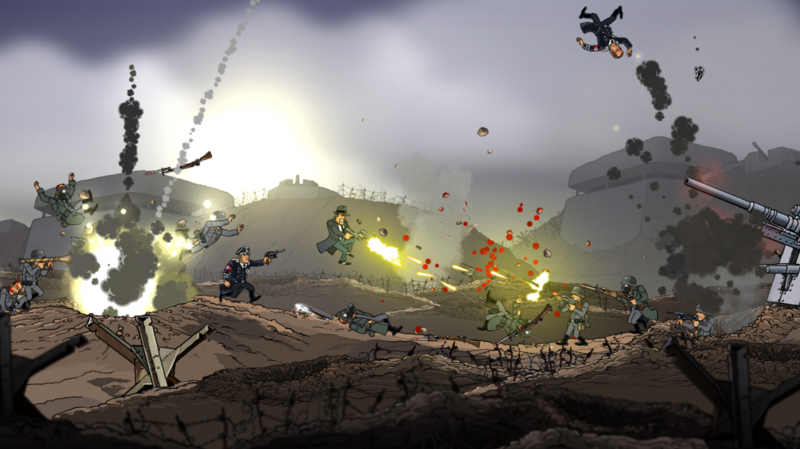 Featuring the same gorgeous hand drawn characters and backgrounds, the action will take Vinnie as far as the European battlefields of the second World War. Because the only thing that’s more fun than killing zombies, is blasting the hell out of some (undead) Nazis with some friends. The game will be playable at GDC, so if you’re in town feel free to stop by the Microsoft booth and play the demo. We know we will! Guns, Gore & Cannoli 2 is set to release this summer on PC, PS4, and Xbox One. In the meantime, you can like the game on Facebook, follow the devs on Twitter for the latest news, and start polishing the barrel of your Tommy Gun. You’re going to need it!